eBooks, online at ebooks.com, is a world leading source for ebooks. eBooks offers a huge selection of ebook titles, from best-sellers to new releases to timeless classics. Downloading from eBooks is simple and takes only a couple minutes. 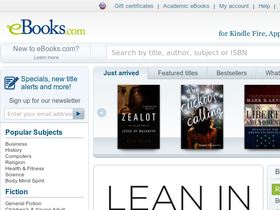 Plus, eBooks offers their software for free. eBooks offers their ebooks in PDF, ePub, and iPhone / iPad / iPod Touch formats. eBooks carries New York Time best sellers, non-fiction, fiction, business, history, computer, health and fitness, children's fiction, and much more. But before you shop, stop by RetailSteal.com for the latest eBooks discounts, eBooks promo codes, and eBooks coupon codes. Use coupon and save 20% on ebooks from the following categories: Art, Photography, Psychology & Psychiatry, Social Science, and Transportation . Click to shop. Enjoy $10 savings on your favorite books from the Education section of eBooks when you use this coupon code! Applicable to orders $80+. Shop at eBooks and save 15% on Drama and Classic Literature books with this coupon code. Click here to shop. Use this coupon code and save 12% on Health & Fitness category books from eBooks.com. Click here to shop. Save 10% on Taxation books with this coupon code at eBooks.com. Click here to shop. Enjoy 20% savings on certain eBooks on Business, Philosophy, Medicine, Reference, Social Science, etc. Click here to shop eBooks and save. Shop the New York Time Bestsellers list at eBooks.com. Bestsellers start at $7.99. Click to shop. Save $3 on your eBooks purchase when you enter this promotional code at checkout! Offer valid on orders of $20 or more. Enjoy a 10% discount on business category purchases when you click our link and use our coupon code to shop today. Save 10% on your eBooks purchase when you use this promotional code on any ebooks order!